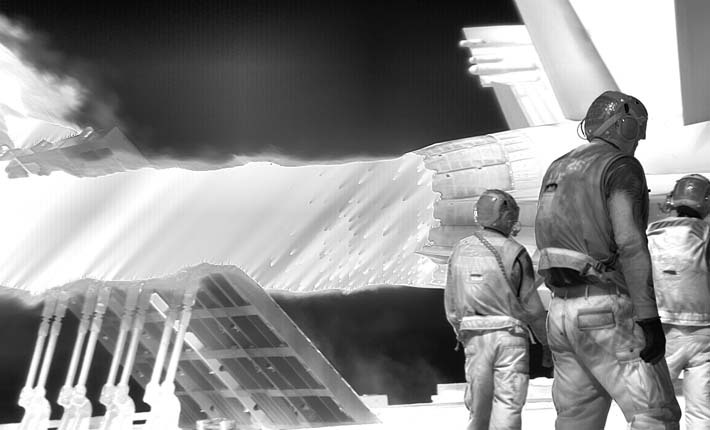 Richard Mosse’s work ‘Grid’ creates an immediate air of surveillance upon walking into the Curve Gallery at the Barbican. Multiple monitors show footage from cameras filming a refugee camp, the cameras pivot and shift from space to space. We are given a sense that this movement, with the shaking of the camera from side to side, is manic in its need to see and assess. The purpose of this surveillance is unclear and we are made immediately complicit in what continues to be an uncomfortable experience. The tunnel-like quality of the Barbican Curve adds to this feeling of sinister unease, when we are forced to walk into the darkness. Everything about the main three-screen film piece ‘Incoming’ sets the viewer on edge, not only the subject matter of the refugee crisis, but the way the people are filmed on military grade cameras. Described as “thermographic weapons”, they register temperature, depicting white where there should be black and black where there should be white. Sounds of an operating theatre are played over scenes of refugees in distress. The beeping of a medical monitor increases as we see families attempting to climb aboard a boat in the Aegean. The voices fade away and we only hear beeping combined with the odd black and white figures of children in the waves trying to climb to safety. The screens contribute to the building tension as they shift, with one going black and another turning on so the viewer is never certain of where to look. The films depict an overwhelming scope, often cutting back to a huge moving ocean that spreads across all three screens. However, the subject matter is also uncomfortable due to its invasive intimacy as the film moves from the universal to the personal. We are plunged into darkness and hear the panicked voices of people and again the noises of what sounds like a hospital procedure, then we watch a highly visceral autopsy being performed on a small dead body. Again the blackness of the interior flesh and sudden white liquid invokes distress–nothing looks as it should. We are also made aware not only of the physical invasion of the deceased’s body but also that there is something deeply inappropriate about the act of filming and viewing a moment like this. 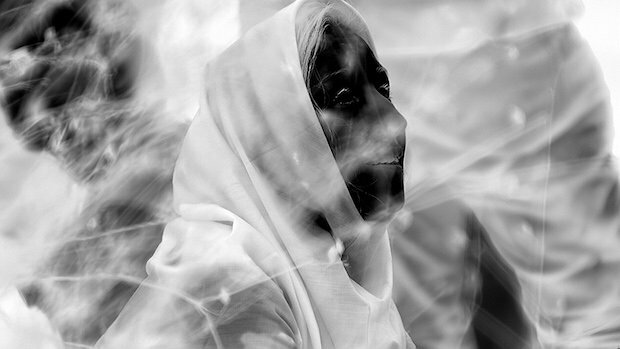 The people at times look like aliens, with their black eyes and the white interior of their mouths. This makes the observation of them seem more natural as they become inhuman. Their tiny figures cross the landscape like small insects and the frequent shots of rubbish, waste, and oil in the water serve as a continual reminder of the damage their presence has on the surroundings. The implications behind this are not clear but one cannot ignore the negative connotations being created. However, we also see things that we otherwise could not—small expressions and mannerisms, even the coils of hair beneath a head scarf. Sweat, spit and heat are suddenly visible to us in minute detail. The cameras enable us to see these people in a visceral way. Yet these depictions are purely scientific, and surely defeat their own purpose: yes, race is removed, but the people are made no more human and sympathy is not induced. Instead their ‘en masse’ presence is only emphasized and at times negatively portrayed. Moments of emotion are sometimes shown, such as a close-up of a woman turning towards the camera in despair or a small child standing alone staring at a phone screen in a prison-like refugee camp near Berlin. These scenes provide signals of humanity that we can understand and empathize with. However, with any sign of the personal we are reminded of the voyeuristic nature of the work. The film objectifies their suffering in many respects, and this begs questions about observing, about place and setting, and about order and disorder. Furthermore, it leads the viewer to question the necessity of further highlighting these issues, given the already problematic portrayal of the refugee crisis in the media. 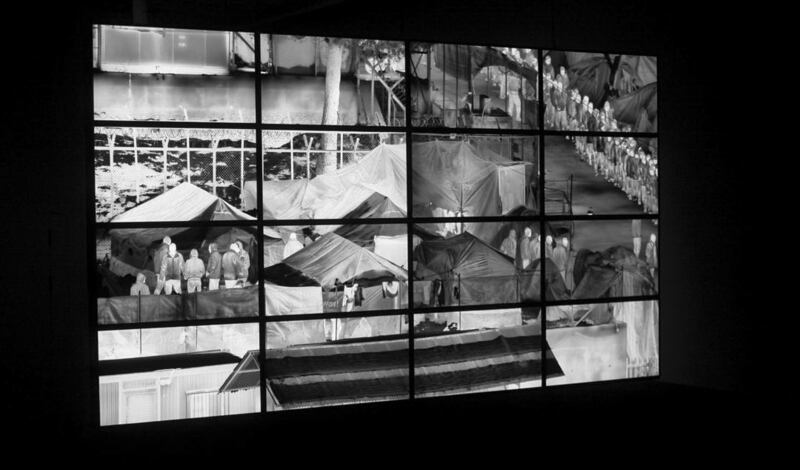 Richard Mosse’s work ‘Grid’ creates an immediate air of surveillance upon walking into the Curve Gallery at the Barbican. The screens contribute to the building tension as they shift, with one going black and another turning on so the viewer is never certain of where to look.